With circular needle cast on 49 stitches. K 35 rows in garter st.
Knit 80 rows. Example: 10 rows avocado, (alternate 2 rows chestnut rows 2 avocado for 14 repeats) 16 avocado for total of 80 rows. Cast on 3 stitches at beginning of round on right-hand needle, slip the three cast on stitches to the left hand needle. Knit 2 stitches, knit into back of third cast on stitch and first edge stitch at the same time. (1 stitch is bound off) Return the 3 stitches on the right hand needle to the left hand needle. Repeat until there are only 3 stitches remaining, cut thread and with blunt needle thread through the 3 stitches and pull tight. Weave beginning and ending I cord together. On 4 stitches with 10 ½ dpn knit 36 inches long. After bag is completely dry, pinch in the ends so that your bag is folded like a paper lunch sack. Insert a double pointed needle about 1.5 inch in from the side and 1 inch down from top. Go through all four layers. Wiggle around the double pointed needle to open the holes. Remove double pointed needle from one side. Thread one end of the I-Cord through two left holes on the side of the bag facing you. Thread the other end of the I-Cord through the two right holes. Turn the bag around and repeat with the other I-Cord. You will now have two ends of the I-Cords sticking out on each side of the bag. Take the two ends on one side and tie them tightly in an overhand (plain old) knot. Or tie them individually. I love your Pop Corn Bag! It's destined to be famous with a name like that. Any suggestions of how to print the instructions out without the pictures? Thanks for a great site. You did a superb job of describing everything. I have seen many instuctions on felting but after trying several methods I have come up with the exact same advice as you have given. (i.e.--don't let it spin) Again let me say how well you described, pictured, and advised on each step. Thanks and Happy knitting from an addicted "felter." Thanks so much for the instructions -- it's great for us new felters! I printed it out for future reference. Several people have mentioned that my Popcorn Bag is like the Booga Bag. While there are some similarities, the Booga Bag DOES NOT have an I-Cord bind off. My bag does. 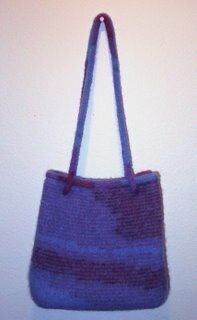 Your Popcorn Bag is my first felting project - I'm very excited, but have 2 questions. 1. Once you're knitting the sides, do you continue in garter stitch or use stockingnette? The pattern says to "knit", but I wasn't sure if that meant to continue in garter stitch. 2. Could you give a bit more detail on how to make the I-cords? Is it 4 stitches total with 2 needles? I haven't tried it yet, but it seems like that would be cumbersome. Thanks for the beautiful pattern - I'm excited about making it. Hopefully you can paste that addy into your browser. If you do a post using your email address I will try to help you. I love your bag, and I'm on the way to grab some new yarn so I can make one. 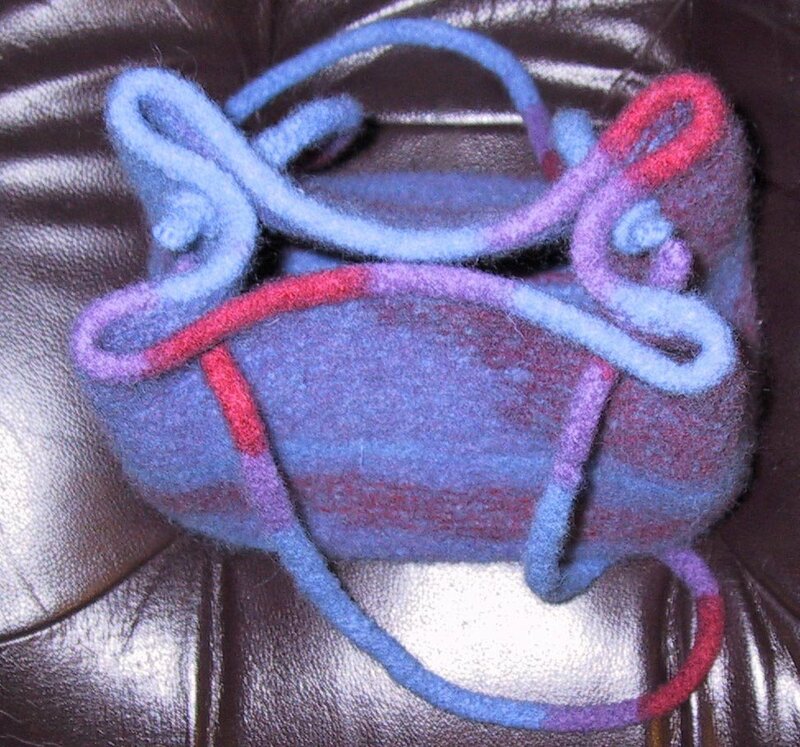 I've been knitting since 1987, but just learned felting 2 years ago. I love it. It is amazing how the colors blend together and totally change the look of a bag. 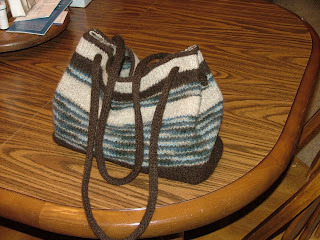 I knitted my daughter a diaper bag when she was pregnant with my grandson and everyone at the shower just loved it. It's that time again and this time I get to do things for a little girl, woohoo. I haven't tried the I-cord bind off, but I will this time, I think it will give it a more finished look. I really love the look of this bag--- but what I especially love is the way the purple lines are placed within the blue body of the bag. Am I missing something, or where were instructions for duplicating that look included in the directions? Can Suzie possibly help out here--- help relatively novice knitters like myself learn how to duplicate this technique? That was handdyed yarn, so it did it's own thing. I dye Lion Brand Fisherman's Wool, with Rit. I recently made & felted my own purse without a pattern and used an I-cord for the straps. However, the straps stretch. They are sewn onto the bag. Do you have any suggestions? I thought of felting the cord again to see if that would help. I love your bags and am anxious to use your patterns. Thank you. My I-cord handles do stretch some, but since I felt all my items until you lose all stitch definition they don't stretch a lot. You could try threading a stablizing thread through the I-cord. You would need to use a sharp needles and a fine strong thread or unwaxed dental floss. Thanks for the advice on the i-cord stretching question. I think I did not felt long enough for the cord. I'm going to felt it again and try your suggestion of the stabilizing thread. Thanks so much - love your sight. Felt the bags and I-cords at the same time. Check on them during the felting process, as they can get tangled. Just straighten them out and keep felting. I dont see why its called a popcorn bag!!!!!!!!!!!! it has nothing to do with popcorn. Could someone please give me an answer???? Guess you didn't read the part where I said I blocked it over a popcorn box. I'm curious about the holes for the I-Cord. So the holes aren't buttonholes that you do while knitting? You make the holes after felting? Thanks in advance for clarifying. Yes you are correct, the holes are made in the bag after felting. Where are the “ Seperate felting instructions”?